Margaret A. PALMER is a Distinguished University Professor at the University of Maryland, College Park, and Director of the National Socio-Environmental Synthesis Center. Her research has focused on coastal and freshwater ecosystems with an emphasis on restoration of rivers, streams, and wetlands. She is an international leader in restoration ecology, has 175 peer-reviewed articles and led the 2nd Edition of the Foundations of Restoration Ecology, a widely used text. Palmer is also known for her work at the interface of science and policy, having served as a technical advisor and innovator that helps build solution-focused teams to solve problems that have social, legal, policy, and scientific aspects. As Director of SESYNC she leads efforts to champion new approaches for fostering research collaborations between social and natural scientists on problems at the interface of people and the environment. Palmer’s work has been supported primarily by the National Science Foundation with additional funding from other federal agencies and foundations. She serves on numerous scientific advisory and editorial boards including the Water Sciences & Technology Board of the National Academies of Science and the journals Restoration Ecology and Science. Her awards include AAAS Fellow, Aldo Leopold Leadership Fellow, Ecological Society of America (ESA) Fellow, Lilly Fellow, the Society of Freshwater Science (SFS) Award of Excellence, the ESA Sustainability Science Award, SFS Fellow, and the Ruth Patrick Award from the Association for the Sciences of Limnology and Oceanography. She has been an invited speaker in numerous and diverse settings including regional and international forums, science-diplomacy venues (e.g., in North Korea), and popular outlets such as the Steven Colbert show. National Socio-Environmental Synthesis Center, University of Maryland, U.S.A. Despite the essential role that water plays in life, humans have degraded ecosystems to such an extent that the quantity or quality of water in streams, rivers and wetlands is at risk worldwide. In response, efforts to restore degraded aquatic systems have grown dramatically. While many restoration projects have focused primarily on ecological structure, restoration in practice has its scientific roots firmly in ecology and related fields that emphasize the role of ecological processes and landscape context in determining the self-sustainability of ecosystems. Without recovery of basic ecosystem processes including interactions at watershed scales, restoration is unlikely to lead to self-sustainability. I will provide a brief overview of restoration approaches and outcomes in the context of hydrologic and biogeochemical processes followed by several case studies as examples concluding with research needed to move restoration science forward. 146 Loring Bailey Hall, UNB Biology Department, Fredericton - Tuesday, November 6 between 11 am - 12 pm. Mike & Ophelia Lazaridis Quantum-Nano Centre (QNC), Room 0101/1103A, University of Waterloo - Wednesday, November 7 between 11 am - 12 pm. Dr. Kirk Winemiller is Regents Professor in the Department of Wildlife and Fisheries Sciences at Texas A&M University. His research is focused on fish population and community ecology, life history strategies, and food web ecology with emphasis on rivers, streams and estuaries. He also studies evolutionary ecology, including adaptive radiations and convergent evolution in tropical fishes. Winemiller and his collaborators have conducted field research at locations throughout Texas, Central America, South America, Africa, and Asia. He has collaborated with numerous international researchers and students, with dozens visiting his Aquatic Ecology Lab at Texas A&M for professional exchanges and research collaborations. Winemiller has served on numerous scientific committees reviewing ecological and policy issues associated with management of freshwater resources in Texas, California, and other regions. Winemiller obtained BA and MSc degrees from Miami University of Ohio and PhD from the University of Texas at Austin. Prior to joining the faculty at Texas A&M University, he was a research associate with the Oak Ridge National Laboratory in Tennessee. Winemiller teaches graduate courses in population dynamics and community ecology, and undergraduate courses in ecology. He has trained 45 PhD and MSc students during 25 years at Texas A&M. In 2007 he was elected a Fellow of the American Association for the Advancement of Science. He was awarded the Ecological Society of America’s Mercer Award, Texas Chapter American Fisheries Society’s Award for Outstanding Fisheries Research, and Texas A&M’s Vice-Chancellor’s Award for Outstanding Graduate Teaching, Vice Chancellor’s Award for Outstanding Undergraduate Teaching, Vice Chancellor’s Award for Outstanding Research, Dean’s Outstanding Achievement Award for International Impact. Bush Excellence Award for International Teaching, President’s Award for Service to International Students, and Association of Former Students Award of Research Excellence. He was designated a TAMU AgriLife Faculty Fellow and twice was awarded U.S. Fulbright. Nearly half of the world’s 30,000 fish species live in lakes and rivers that cover just 1% of Earth’s surface, and the rest are found in oceans that blanket 70% of our planet. The vast majority of freshwater fishes are found in the tropics, and about one third occur in three great river basins – the Amazon, Congo, and Mekong. Hundreds of new fish species from tropical freshwaters are formally described and named each year. Tropical fishes display unusual and sometimes bizarre strategies for feeding, defense, reproduction, and environmental tolerance – resulting in specialized ecological niches that are unparalleled in temperate fish faunas. Unfortunately, tropical rivers and their remarkable fishes are increasingly impacted by human actions, including construction of hydroelectric dams, mining, overfishing, and introduction of nonindigenous invasive species. This lecture will provide an overview of the ecological diversity of tropical freshwater fishes, while advancing the idea that convergent evolution in form and function is widespread. The concept of a periodic table of niches is offered as a framework to study ecological diversity and evolutionary convergence. The lecture also will illustrate some of the major threats to tropical fishes, and discuss prospects for mitigating their impacts. 146 Loring Bailey Hall, UNB Biology Department, Fredericton - Thursday, October 26 between 7 – 8 pm. Does pulsing hydrology promote productivity and resilience of river food webs? Strongly and regularly pulsing ecosystems seem to have greater productivity and resilience to human disturbances than less variable or irregularly varying systems. For example, tropical lowland rivers have higher fisheries yields per unit habitat when compared to lakes, and in the marine realm, coastal upwelling areas are more productive than coral reefs and pelagic areas. Why does the annual flood pulse of tropical river-floodplain ecosystems promote productive and resilient fish communities? Theoretical food-web models support the idea that spatial heterogeneity and between-habitat trophic linkages associated with mobile consumers have a stabilizing effect on community dynamics. In rivers, temporal and spatial aspects of heterogeneity are tightly linked and have comparable effects. This lecture will explore mechanisms that promote productivity and resilience of fluvial ecosystems, especially in the tropics. Of course there are limits to the resilience of river-floodplain fisheries, and over-exploitation can result in regime shifts whereby catches become dominated by small, short-lived, species with opportunistic life history strategies. Moreover, fish stocks in oligotrophic ecosystems seem to be more sensitive to overharvest than those in more productive systems. One could argue that all ecosystems are, to varying degrees, influenced by pulsing drivers, and development of a general theory could improve natural resource management. Dr. Johnston is head of the Applied Marine and Estuarine Ecology Lab at the University of New South Wales and a rising star in the field of harbour and estuarine ecology. She might be best known to the public as a co-presenter of the Foxtel/BBC television series Coast Australia. She is an expert in how humans impact harbours, coasts and estuarine habitats and has an exciting program that both expands our understanding of these systems and provides recommendations for harbour management. Her laboratory is the Sydney Harbour, one of the busiest ports in the southern hemisphere. Coastal marine ecosystems are both highly diverse and highly productive. Humans rely on these ecosystems for a range of services such as food, recreational amenity, waste disposal and tourism. Coastal ecosystems are also the most intense areas of industrial and urban development today. Increasing trade by sea and advanced technologies for resource extraction are converging with a strong trend towards coastal population growth to place intense pressure on these environments. Human activities have introduced an array of stressors that may affect both the diversity and functioning of marine ecosystems and, in some extreme cases, cause ecosystem collapse. Our growing use of the coast is therefore a crucial issue, not only in terms of contested space, but also in terms of cumulative threats posing serious problems for ecosystem integrity. Key to the future sustainable development of the coast is the development of accurate and efficient diagnostic tools for assessing ecosystem ‘health’ and novel eco-engineering designs for coastal constructions. Professor Johnston will outline ways in which the latest research is helping to provide solutions to the coastal squeeze. Estuaries are among the most highly disturbed of all aquatic environments due to their proximity to urban, agricultural and industrial activity. Aquatic communities are exposed to multiple stressors and it is vital that the ecological consequences are identified and distinguished using a range of observational and manipulative techniques. I will present our research, combining the disciplines of ecology and ecotoxicology, to identify drivers of marine invasion success, the plasticity of environmental niche space, stressor interactions and contaminant impacts on ecosystem functioning. In addition, I will detail how molecular approaches (targeted gene and meta-transcriptomics) are enhancing our capacity to observe biodiversity, community connectivity and ecological change. Molecular approaches are now sufficiently advanced to provide, not only equivalent information to that collected using traditional morphological approaches, but an order of magnitude bigger, better, and faster data. Julian Olden is an Associate Professor at the University of Washington and spends his time studying invasive species, ecohydrology, biogeography, and food web ecology of freshwater ecosystems. Growing up on a sailboat on the waters of Lake Ontario, Julian conducted his undergraduate studies in the Department of Zoology at the University of Toronto. It was during this time that his passion for freshwater conservation was first sparked; specifically while hauling nets choked with squirming white suckers. Next, Julian received his Master’s Degree in Zoology at the University of Toronto, his doctorate in the Ecology Program at Colorado State University, and then was awarded a David H. Smith Conservation Post-doctoral Fellowship to work in the Center for Limnology at the University of Wisconsin. Nowadays, Julian and his students are working hard to save the world, squeezing one fish at a time. Science lectures: Racing against extinction: Will freshwater fishes keep pace with climate change? Climate change is poised to challenge the future persistence of organisms across the globe, and many uncertainties remain to whether, and if so how, species will cope. Despite mounting evidence in terrestrial and marine ecosystems that the rapidity of climate change may exceed the dispersal ability of many species, the question of whether freshwater species will be able to respond has not been considered. My presentation will explore whether freshwater fishes will keep pace with projected climate warming in contemporary riverscapes where dams represent ubiquitous barriers to dispersal and habitat may simply run out at watershed divides. By linking geographic patterns and variability in climate change velocity to spatially explicit estimates of maximum dispersal rates and physiological tolerances, I quantify the fate of nearly a thousand fish species in over 6 million river kilometers across the contiguous United States. Next, I highlight examples from the Columbia and Colorado River Basins where opportunities exist to mitigate future climate-induced changes to freshwater ecosystems. Public lecture: Invasive species: Staying the course or exonerating crimes to envision a new future? Invasive species stand accused of ecological insubordination, mass murder, and other horrific crimes against nature. Ecologists have reacted by using militaristic terms such as “battle”, “harm”, “destroy”, and “meltdown” when communicating about these species. Although the use of such war metaphors in science is not new and often packs political punch, they have also led to a drastically limited perception of non-native species within society. I argue for a reconsideration of our managerial ethos towards non-native species with the hope that it encourages a constructive discourse about the undertones of invasion biology: our grief, our challenges, our opportunities and even our hopes. Ecosystems now contain a species blend of the old and the new; we must decide as a society what our future will look like, where we should control it and where we should not. Drawing from a rich body of literature and my lab’s research I deploy a futuristic approach to postulate the possible, probable, and preferable alternative global scenarios of freshwater ecosystems in response to biological invasions and the worldviews and myths that underlie them. Research Landscape Ecologist with the U.S. Geological Survey (USGS) Forest and Rangeland Ecosystem Science Center (FRESC) Cascadia Field Station (CFS) at the School of Environmental and Forest Sciences in the University of Washington in Seattle (USA). Scientists are now in an era when our ability to collect data may exceed our capacity for its validation, analysis, visualization, and storage (Microsoft Research 2009). This period of “data-intensive discovery” is based on an emerging ‘fourth paradigm’ in which entirely new scientific methods of inquiry and analysis are needed to explore patterns that were historically beyond our reach. River scientists have long lagged behind oceanographers in their collection and analysis of ‘big’ data largely because the geographic and physical characteristics of rivers make them difficult to study (i.e., too narrow to easily assess with satellite imagery and too shallow for use of traditional oceanographic equipment). However, in recent years riverine scientists have been tackling problems that require entirely new ways of thinking. Remotely sensed data and spatially explicit modeling of stream networks offer rich opportunities for such ‘data-intensive discovery’. Controversial and creative new approaches such as the ‘hypothesis-neutral approach’ and ‘inferring process from pattern’ are being explored in terrestrial ecology and offer fertile ground for understanding the complex interactions between streams and their valleys. This ‘fourth paradigm’ for collecting, modeling, and analyzing spatially (and potentially temporally) continuous data may lead to completely new ways of understanding stream ecosystems and their land-water linkages. In this presentation, I review these concepts and provide examples of how new kinds of data might be explored to reveal unexpected patterns in rivers. I also emphasize the importance of providing these new perspectives to future river ecologists as they will need to combine traditional science with new data-intensive approaches to provide the knowledge needed to ensure effective management of rivers. Internet maps, global positioning systems (GPS), and satellite imagery have transformed our access to spatial data and provide unlimited opportunities to ‘see’ rivers in new ways. Rivers are dynamic systems that have always been difficult to visualize, but the fundamental change in society from spatial-data ‘limited’ to ‘inundated’ is changing our perception and understanding of rivers. The ways we ‘see’ rivers through remotely sensed imagery and vast networks of in situ sensors are rapidly improving, but this information for rivers is still not as accessible as maps, satellite imagery, and traffic data in Google Earth and Google Maps. We need to be able to use tools like these to show how rivers change over time, in three dimensions, across a whole spectrum of physical and biological features (e.g., water quality, quantity, and organisms). Given the importance of rivers and the stresses they are currently under, this Google Earth Era provides a unique opportunity to combine a wealth of information across scientific disciplines (e.g., computer science, mathematics, geography, and ecology) to increase public awareness and to address urgent needs to manage and conserve rivers in a changing world. In this presentation, I provide examples of how we might better use the technology that is so much a part of modern society to visualize the full complexity of rivers. I also highlight the need to incorporate the Google Earth Era in how we study and educate future generations in the ecology of running waters. Public Lecture: "Potential effects of climate change on stream organisms"
While increasing temperatures have received much of the focus in climate change research, in this lecture I will discuss how associated increases in the frequency and intensity of extreme weather events, such as droughts and floods, have important consequences for stream organisms. Students and senior investigators at the Rocky Mountain Biological Laboratory are investigating the potential for those events to negatively affect plants, insects and trout in high elevation streams of western Colorado, USA. For example, droughts decrease the reproduction and survival of mayflies, a common prey for trout, because sites where the mayflies normally lay eggs are no longer under water. In addition, nematode parasites may increase during drought years, because of an increase in nuisance algae (Didymosphenia geminata), which provides an excellent habitat for the free-living stages of the worms. More nuisance algae also creates habitat favourable to aquatic earthworms, which are the intermediate host for a debilitating parasite of trout (whirling disease). Increasingly earlier snow melt and peak flows in these high elevation streams are associated with blooms of nuisance algae, which can also change the composition of stream insects from predominance of mayflies to lower quality food species (midges) and reduce growth rates of trout. These findings have implications for the consequences of managing flows that leave too little water in trout streams. Such disruptions of the natural flow from climate change and inappropriate management strategies could jeopardize the sustainability of otherwise pristine mountain streams. Science Lecture: "Ecology of Place”: exploring the strength of species interactions along a disturbance gradient in high elevation streams"
In this lecture I will describe long-term studies in one mountain stream ecosystem (“The Place”) suggesting that the strength of interactions among species in food webs is affected by the disturbance regime. We compared the hydrological regimes and streambed movement of multiple streams in one high-elevation catchment of western Colorado, USA and tested the role of disturbance on predator-mediated interaction strength between grazers and algae. Surveys and in-stream experiments tested whether the presence of trout influenced the abundance and foraging behaviour of grazing invertebrates and their effectiveness in controlling the abundance of algae. Surveys showed that the grazer communities changed depending on the disturbance regimes, with mayflies dominating in disturbed streams and caddisflies in benign streams. Experiments demonstrated that the impact of grazers on algae was lower in disturbed streams, and the trophic cascade from trout via mayflies to algae was only evident under conditions of no nutrient limitation. This research reinforces the value of conducting long-term studies in one place, and the importance of explicit consideration of environmental context to achieving comprehensive understanding of trophic interactions. We are fortunate to be hosting Dr. David Schindler, Killam Memorial Professor of Ecology from the University of Alberta as this year’s H.B.N. Hynes lecturer. He is one of Canada’s top environmental scientists and is known worldwide for his leadership in aquatic sciences, especially in understanding the effects of eutrophication and acid precipitation on lakes. He established the Experimental Lakes Area (ELA), a research facility that is unique in the world for its ability to conduct experiments on whole ecosystems. Many of the studies done at ELA under his leadership directly and effectively influenced legislation to decrease emissions of acidifying substances from smokestacks and the use of phosphates in detergents and their release in municipal wastewaters. More recently his research has focused on the effects of climate change on aquatic ecosystems, the eutrophication of Lake Winnipeg, the restoration of lakes from stocking of alien fish species or from excessive nutrient inputs, and the downstream impacts of oil sands development. Dr. Schindler has been recognized for his high-impact science and contributions to public policy and education countless times. As examples, he received the first Stockholm Water Prize, the Volvo Environment Prize, the Tyler Prize for Environmental Achievement, and Canada’s highest scientific honour the Gerhard Herzberg Gold Medal for Science and Engineering. He is Chair of the Board of Directors of a non-profit foundation, the Safe Drinking Water Foundation, that educates Canadian students about the importance of water and helps aboriginal communities with water problems. For his tireless promotion of science and education of non-scientists, he received the Royal Canadian Institute’s Sandford Fleming Medal for public communication of science. Among many other accolades, he is a Fellow of the Royal Society of Canada, was awarded eleven honorary degrees from universities, and has an Endowed Professorship in Aquatic Sciences at Trent University. 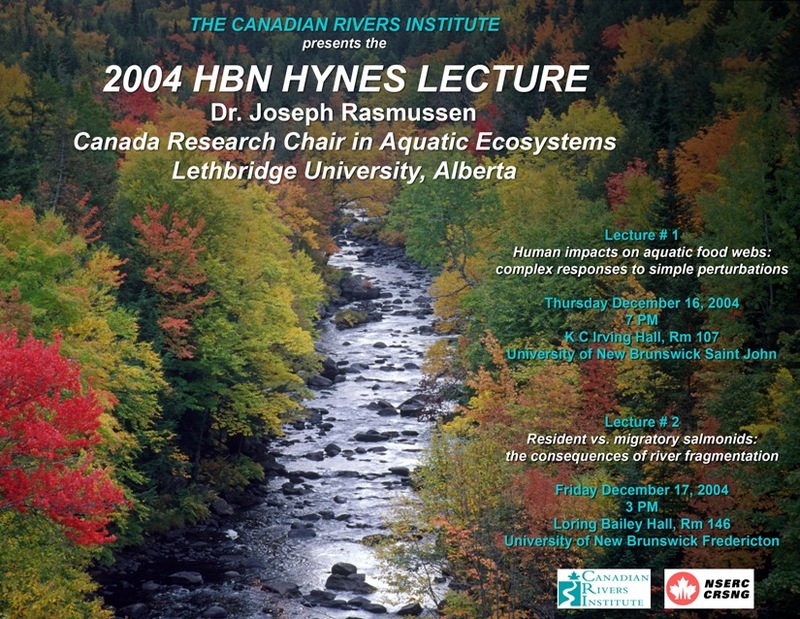 He will be speaking at UNB Saint John and Fredericton November 15th and 16th, 2012, respectively, on impacts of oil sands and cultural eutrophication on Canadian waterways. The Alberta oil sands are being promoted by the oil sands industry and by government officials as the solution to North American energy needs for the foreseeable future. The impacts of oil sands development have been downplayed in propaganda promoting the oil sands. In this lecture, I will discuss some of the impacts that have been ignored or misrepresented, such as water quality, fisheries, wetland reclamation, carbon sequestration, and treaties with aboriginal communities. Following the advice of several expert panels, on October 17th, 2012, Alberta Minister of Environment, Water and Sustainable Resources Diana McQueen announced an independent agency to direct a new and improved monitoring program on the Athabasca River. This need for this initiative and the broad-ranging effects of oil sands development will be discussed. Eutrophication occurs in surface waters when there are excess inputs of nutrients, resulting in blooms of algae and degraded water quality. In this talk, I review several decades of experience with controlling eutrophication of lakes in Canada and elsewhere in the world. I find that recent studies concluding that nitrogen as well as phosphorus must be controlled in order to reverse eutrophication are erroneous, because they are based on short-term bottle or mesocosm studies that do not include key ecosystem processes such as inter-annual increases in recycling of nutrients, nutrient fluxes from sediments, and long-term changes in community composition. There are numerous cases where reducing phosphorus loading has successfully decreased eutrophication, but no unequivocal cases where nitrogen reductions to lakes have been successful. I will present new results of whole lake experiments at the Experimental Lakes Area in northwestern Ontario where phosphorus and nitrogen loading were increased or decreased singly and in combination, and a new summary of how climate change and increased human activity in the watershed have combined to cause the rapid eutrophication of Lake Winnipeg. Dr. Allan's research investigates stream ecosystems and the influence of human activities on rivers and their watersheds. This includes active research into the effects of landscape and land use on stream health, assessment of variation in flow regime, and estimation of nutrient loads and budgets. Additional, collaborative activities are directed at the translation of aquatic science into useful products for management, conservation and restoration of running waters. Streams: Their Ecology and Life (Cushing and Allan 2001). Science Lecture: "Century-scale changes in catchment nutrient inputs and outputs"
Monday, November 7th - UNB Saint John Campus, Ganong Hall lecture theatre, 2:30 pm. Public Lecture: "Lessons learned from assessing multiple stressors to the Great Lakes ecosystem"
Tuesday, November 8th - UNB Fredericton Campus, Loring Bailey Hall, Room 146, 7:00 pm. 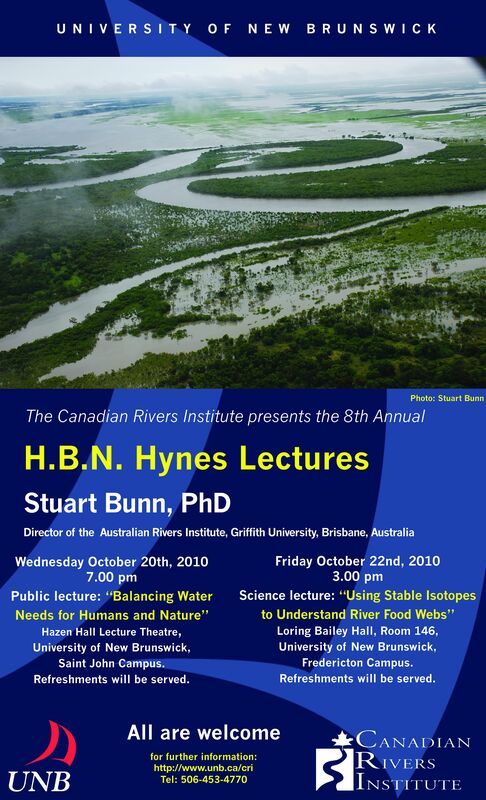 Prof. Bunn co-author of Global threats to human water security and river biodiversity released in Nature September 30, 2010. Rivers, lakes and wetlands contain only a fraction of the world's water and cover less than 1% of the Earth's surface, yet they support about 10% of the animal species, including about a third of all known vertebrates. They also sustain much of humankind, yet our exploitation of these resources threatens freshwater biodiversity - and our own water security. We have modified flow regimes and isolated rivers from their floodplains and the sea with barriers and dams. Changes to our climate have already resulted in lower rainfall in some regions, diminishing water supplies. Increased pollution of waterways has compounded the problem further by reducing availability of safe, clean water. While major technological investments have overcome many of the threats to human water security in the developed world, over 3 billion people still live in regions under high threat. Unfortunately, no similar investments in aquatic ecosystem protection have been made, and the threat to freshwater biodiversity remains high in rich and poor nations alike. Extinction rates of freshwater animals are twice as high as those on land and in the sea. Globally, at least 10,000-20,000 freshwater species are already extinct or at risk, and further declines in biodiversity are predicted as a consequence of climate change and an expanding global human population. There is, however, much we can do to reduce the impact of human activity on freshwater biodiversity and, at the same time, to meet societal needs for water. In this presentation, I will discuss this global challenge and highlight some of the ways we can reduce the impact of human activity on freshwater biodiversity and the general health of our waterways. Video of lecture. Stream and river ecosystems have long been regarded as heterotrophic systems, driven by inputs of terrestrial organic matter and nutrients from the surrounding watershed. However, only a small fraction of the total carbon present in a stream or river is likely to enter the aquatic food web: not all is of sufficient quality or is truly available for consumers. Identifying the source or sources of organic carbon that sustain populations of invertebrates, fish and other consumers remains a fundamental challenge. Stable isotope analysis has proved to be an effective tool in the study of food webs in aquatic ecosystems where there are often marked differences in the signatures of primary sources. However, its application to the study of stream and river food webs has often been confounded by considerable variation in the carbon isotope signatures of algae and overlap with terrestrial plant values. Despite these methodological problems, a consistent pattern seems to be emerging from studies across a range of biomes that inconspicuous sources of primary production are major contributors to the biomass of metazoan consumers. In this presentation, I will review how stable isotope tracing has changed our views on river ecosystem function, discuss some of the limitations of this approach in food web studies, and highlight some future research directions. This year, ourspeaker will be Dr. Faye Hicks, one of the leading experts on river ice, a subject of obvious importance to anyone studying rivers in Canada. Dr. Hicks is a professor at the University of Alberta, where she teaches undergraduate and graduate courses in hydraulics, and has research interests in the areas of river ice processes and hydraulics, ice jam flood forecasting, and environmental impacts of river ice. From her webpage, you can see her many interests, teaching, and awards, including recent ones for outstanding contributions to the development and practice of hydrotechnical engineering in Canada, and modernization of the provincial river ice program, as well as the highest award given to professors at University of Alberta, and a mentoring award from the Alberta Women's Science Network. Each year, as winter approaches, our Canadian rivers undergo a magical transformation as flowing water begins to freeze. Whether it is frazil ice, hanging dams, hummocky ice, anchor ice, ice jams or even ‘pizza' ice - the processes that form river ice are beautiful and fascinating. Perhaps you have never noticed the complexities of river freeze-up and would like to learn more, or maybe you have witnessed these processes many times and would just like to know exactly why these strange things happen? In this presentation, we will explore both freeze-up and breakup processes on rivers, through a combination of photographs and video clips. Learn why some rivers never freeze over, why anchor ice is dangerous to fish and why some rivers freeze from the top down, while others do the opposite. Witness the awesome power of river breakup, and the fearsome nature of the flash floods caused by ice jams as they form and release. Learn how river ice engineers and scientists study and predict these complex natural phenomenon. Together we will visit some of Canada's most remote, dynamic and beautiful rivers as they experience the weird and wonderful world of river ice. For a video of this lecture please click here. River ice can be both beneficial and detrimental to Canadians. While ice roads and ice bridges provide essential transportation links to Canada's north, ice jams can cause flash floods that threaten lives and property with little or no advance warning. Of increasing concern are the potential impacts of human influences on river ice processes, both directly in terms of hydro-power development and indirectly in terms of climate change. In this lecture, we will explore complexities of dynamic ice processes through a combination of photographs and video clips. Specifically, you will see the many ways in which river ice scientists and engineers use experimental and field studies to expand our knowledge and understanding of river ice dynamics. With an emphasis on processes, problems and solutions, rather than the underlying math-physics, we will also examine the new developments in computer modeling aimed at predicting ice jam floods, as well as the influences of hydro-power development and climate change on the ice regime of rivers. We will also examine the implications of this research for a variety of water resources engineering and ecological applications, including flood forecasting, and the assessment of winter water supply and physical fish habitat. The Canadian Rivers Institute is delighted to have Dr. Junk as our 2008 Hynes Lecturer. is a retired leader of the Working Group of Tropical Ecology at Max Planck-Institute for Limnology, Plon, Germany. Currently, he is a visiting professor at INPA and State University of Manaus (UEA), Manaus, and Federal University of Mato Grosso, Cuiaba, Brasil. Dr. Junk's area of expertise is in ecology and sustainable management of floodplains, land-water interactions. His main research areas are: studies on biomass, primary production, and decomposition of wetland plant communities; nutrient fluxes between land and water; adaptations of plant and animals to periodical drought and flooding; ecology of aquatic macrophytes and fish communities; biodiversity; conceptional considerations on river-floodplain systems, sustainable management of wetland resources and wetland protection with emphasis on the Amazon River floodplain and the Gran Pantanal, Brazil. River floodplains are very complex ecosystems. Hydrologic dynamics and the shift between terrestrial and aquatic phases create permanently changing environmental conditions that are difficult to understand and even more difficult to predict. However, the species-rich and, in part, highly adapted flora and fauna point to inherent regulations that make river floodplain systems to a certain extent predictable and explain the development of the various adaptations of their plants and animals. The Flood Pulse Concept (FPC) integrates scientific data to explain the structure, function, and biodiversity of river floodplains. It also contributes to predicting the impacts of floods and droughts as well as those of man-made changes on the hydrology, connectivity between floodplain and river channel, and in the resident flora and fauna. This lecture provides an overview of floodplain ecology in the context of the FPC. The most common human impacts on floodplains are discussed and proposals are made for the sustainable management of floodplain ecosystems. Large-river floodplains occur along the entire climatic gradient, from high latitudes to the humid tropics. These climatic variations have a major impact on the biota living in river-floodplain ecosystems. Differences in the reactions of plants and animals to similar flooding events can be explained by differences in climate; however, they also require an analysis of the paleo-climatic history, as it strongly influenced the evolution of organisms and, due to the varying extinction rates, the composition of the fauna and flora. Evidence for this view is provided by comparing the ecological conditions in the tropical Amazon River floodplain and the Pantanal of Mato Grosso, Brazil, with those in the large-river floodplains located in temperate regions of Europe and North America. Restoring Rivers for Fish and Fishers: There are two forms of water conditions in rivers that fish and aquatic insects interpret and adapt to with remarkable skill. In still water the conditions are primarily shaped by the geometry of the river channel. In flowing water the conditions are particular structures within the flow, for example, the rotational currents formed in meanders or the back-eddies and pools of refuge created next to torrents and rapids. The flowing forms are also responsible for shaping mobile streams into meanders, pools and riffles. Both water conditions are strategically used by insects and fish for migration, spawning, feeding and resting. Stream Restoration Science - New Blends of Old Wine: The present uncomplicated hydraulic theory for uniform and rapidly-varied river flow is derived from observations and experiments undertaken in the 18th Century, for example by Daniel Bernoulli (1700-1782) and Antoine Chezy (1718-1798). Other scientists and engineers have further defined the forms of flow and their occurrence in natural channels; Froude (state of flow), Reynolds (turbulence), Prandtl (separation), Yalin (meanders), and Leopold and Wolman (river geometry) to name a few. Contemporary studies in stream ecology (now coined as eco-hydrology) have followed the advice of Noel Hynes in 1971 to "unite the stream and its valley". This led to the also uncomplicated river continuum model and the use of flow parameters to describe the habitats of insects, fish and aquatic plants. The early science and contemporary observations are presented and then illustrated in a few examples of restoring fish habitats and migration in channelized and dammed streams. Since joining the faculty at the University of Georgia in 1977, Dr. Meyer has focused her research on nutrient pollution in streams and rivers, on the natural processes that maintain water quality, and on the effects that development (e.g. urbanization) and water management have on aquatic systems. She has been heavily involved in public education, has worked with numerous conservation organizations, and has targeted much of her research towards addressing issues of concern to these groups and to the general public. Her work has improved our understanding of how we can reduce our impacts on streams and rivers, and has been critical in improving water policy in the United States. She has also been a consistent and effective advocate for streams in the policy realm. As part of many conservation and governmental advisory boards, she regularly helps law makers integrate science and policy to improve water planning at the local, state and federal levels. As part of US Environmental Protection Agency's Science Advisory Board and the University of Georgia's River Center (an institute for the advancement of water science and policy) she has lent her expertise on issues such as the importance of wetlands and small streams to the health of river networks, the importance of stream buffer zones to native fish, the impacts of logging on water quality, and the effects of lawn and agricultural fertilizers and pesticides on streams. More than a third of U.S. rivers are in failing health due to pollution and other factors and, as in Canada, US public and private groups are working to restore the health of their waterways. Dr. Meyer has also been heavily involved in helping to improve "the science and practice" of river restoration by forming a partnership of top river experts in the US that guides future restoration efforts. This partnership is working to answer important questions like "What works best? Which practices can be tailored to certain regions? What does it cost?" The need for healthy rivers, clean drinking water, vigorous fisheries and outdoor recreation demands research-based answers to these questions. Dr. Meyer has been the president of the Ecological Society of America, is on the board of American Rivers, was a 2002 National Clean Water Act Hero, received the 2003 Award of Excellence from North American Benthological Society, and is a fellow of the American Association for the Advancement of Science. 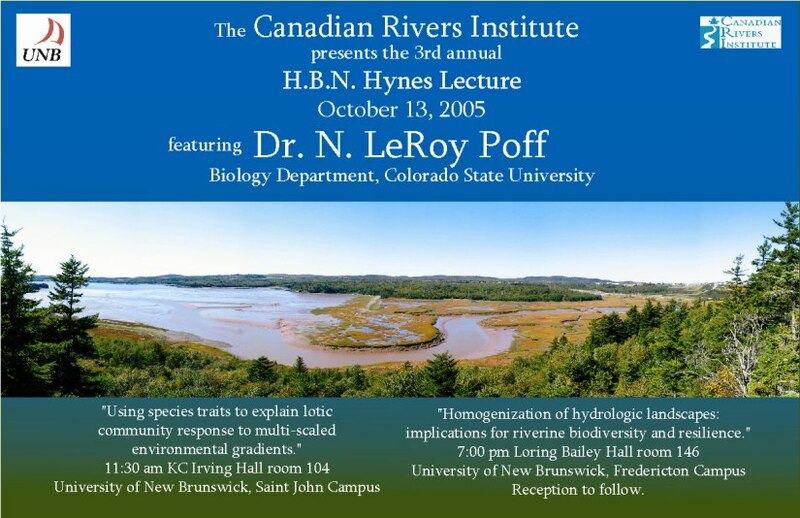 LeRoy Poff visited the CRI in 2005 presenting papers on "Homogenization of hydrological climate landscapes: la implications for riverine biodiversity and resilience" and "Using species traits to explain lotic community response to multi-scaled environmental gradients". Dr. Poff's research interests are guided by the broad consideration of how ecological processes and patterns are constrained by habitat structure and environmental variability at multiple scales in aquatic ecosystems. Small-scale research focuses on how spatial habitat heterogeneity influences the strength and outcomes of interactions among insect grazers and how these grazers regulate stream algal production across gradients of current velocity. At larger scales, research focuses on testing general ecological theory predicting how the structure and functional organization of biological biological communities (invertebrates and fish) depend on habitat stability. We are interested in integrating ecological response across all levels of habitat constraint, from local patches to whole watersheds. This research provides a basis for predicting aquatic community attributes at geographic scales and for ecological responses to land- use alterations and regional climate changes. Joseph Rasmussen presented papers entitled "Resident versus migratory salmonids: consequences of river fragmentation". Dr. Rasmussen holds a Canada Research Chair in Aquatic Ecosystems at the Water Institute for Semi-arid Ecosystems (WISE), University of Lethbridge, Alberta, Canada. He is a professor of biological sciences and his interests include aquatic ecology, food web energetics, and conservation. He is most interested in the effects of human activities on ecosystem function, fisheries, and water quality. These include: contamination (by metals, pesticides, sewage), watershed alteration (land use, impoundments, irrigation) and exotic species introductions. His laboratory has made important contributions of the development of modeling techniques based on isotopic tracers and their application in aquatic science and management. The first H.B.N. 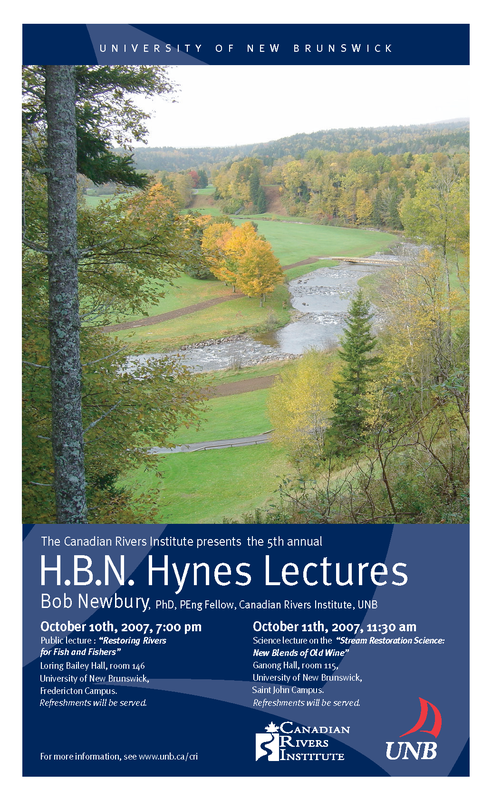 Hynes River Lecture was given on December 2, 2003 by Robert Naiman entitled "The ecology of interfaces: new perspectives from Pacific coast riparian zones." Dr. Naiman is a world-renowned river ecologist focusing on the structure and dynamics of stream ecosystems, riparian vegetation, and the role of large animals in influencing ecosystem dynamics. He is a professor in the College of Ocean and Fishery Sciences at the University of Washington. He has been a research scientist and director of the Matamek Research Program at the Woods Hole Oceanographic Institution, director of the Center for Water and the Environment at the University of Minnesota, and director of the Center for Streamside Sudies at the University of Washington.